Despite nationwide protests across Canada, the lawmakers have passed the controversial anti-terrorism bill, known as Bill C-51, thus granting the country’s spy agency extra powers and carte blanche to operate overseas for the first time. The Anti-Terrorism Act has won the approval of the House of Commons. It passed the third reading by a margin of 183 to 96, thanks to the Conservative government's majority and support from the Liberal Party. It will now move to the Senate for an expected passage into law. The ruling government tabled the legislation in January, claiming it would improve the safety of citizens after two attacks (believed to be the first on Canadian soil) left two soldiers dead in October. Opponents of the bill say it “will recklessly undermine our rights and our privacy while making us less safe.” Tens of thousands of protestors across the nation took to the streets in March saying the bill undermines basic democratic rights and freedoms. A recent Forum Research poll cited by AFP has shown that only one-third of Canadians support the stepped up national security measures, while the majority is against them - renowned author of ‘The Blind Assassin’ Margaret Atwood among them. #BillC51 about to be passed in Canada. See you in the slammer, kids, where I'll doubtless be put on suspicion of being reckless. Me + many. Critics say the new legislation expands the powers of the Canadian Security Intelligence Service (CSIS) and police by boosting information sharing and allowing detention on mere suspicion. The new powers could permit CSIS to thwart travel plans, cancel bank transactions and covertly interfere with radical websites, CBC News reported. The bill proponents say the spy agency is required to get a court order whenever the proposed disruption violates the charter of rights, however. On top of all that, the bill makes it easier for the Royal Canadian Mounted Police (RCMP) to obtain a peace bond (in Canadian law, an order from a criminal court that requires a person to be on good behavior for a period of time) extending the amount of time suspects can be held in detention. "We need to make sure that the jihadi international terrorists who are threatening us are prevented from acting by filling the gap of our information sharing,"Public Safety Minister Stephen Blaney has stated in parliament. In October 2014, a gunman attacked Canada's parliament, gunfire erupting near where PM Stephen Harper was speaking. 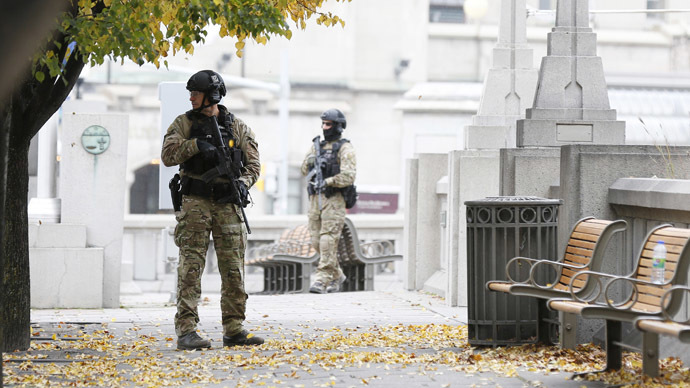 A soldier was fatally shot at a nearby National War Memorial. The gunman was shot dead. That incident elevated the terror threat level in the country from low to medium for the first time since 2010. The shootings followed an attack on two soldiers in Quebec carried out by a convert to Islam.